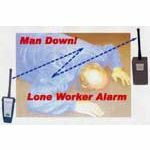 The Lone Worker Alarm offers an easy and cost effective way to protect your staff when they are working alone! It provides an ideal solution for a wide range of health and safety applications. Already a firm favourite with the security and print industries, the Lone Worker alarm offers a practical means of monitoring the safety of staff working alone in any commercial or public sector environment.